No matter where you find yourself on the political landscape, there is always something to lampoon. The current state of politics in the nation leaves no shortage of targets. 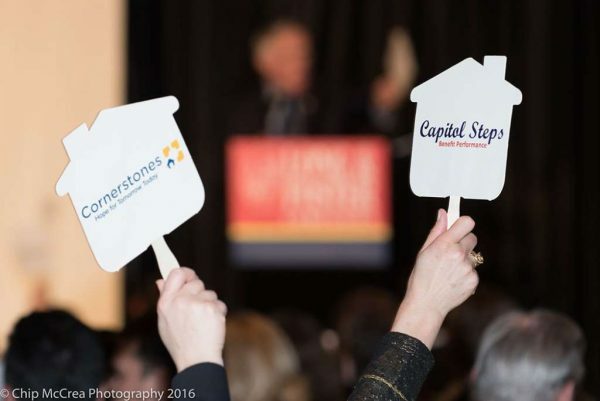 Political satire troupe Capitol Steps will be in Reston once again this month to throw their barbs at those targets, all to benefit a good cause. For the 34th straight year, the D.C.-based group will perform here to benefit Cornerstones. This year’s event is scheduled for Sunday, Jan. 29 at 6 p.m. at the Hyatt Regency Reston (1800 Presidents Street). Tickets for the show are $100, with full tables and sponsorship opportunities also available. Proceeds from the performance will benefit Cornerstones’ efforts to provide affordable housing, emergency shelter, food, financial assistance, childcare and other essential resources to individuals and families in need. Last year’s show raised over $230,000 for those efforts.